One of the biggest challenges in digital photography is producing clean, accurate prints using your desktop printer. How do you tackle color management, screen calibration, printing resolution, and all the other variables that befuddles most photographers between capture and output? 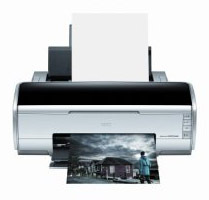 Part 1: Selecting a photo printer. Part 2: Color management, soft proofing, make your first print. Part 4: Paper profiles, RIPs. This is a series I highly recommend. I had been hoping all week to visit a sea turtle underwater, and I finally got my chance while snorkeling at Kahekili Beach Park in Maui. I spotted this guy resting beneath a rock ledge about 20 feet down. I knew that turtles generally come up for air a couple times an hour, so I just hung out to see what would happen. Sure enough, about 15 minutes later he headed for the surface. I gave him lots of space so he could go where he wanted, but photographed his ascent and decent. I have all sorts of great shots in this series, but this is one of my favorites. He looks graceful, and the feeling of weightlessness is really communicated here. After he caught his breath, he went back to his spot under the reef. 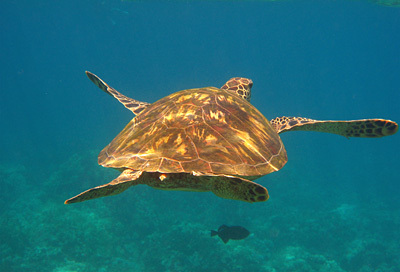 One quick note about sea turtles. 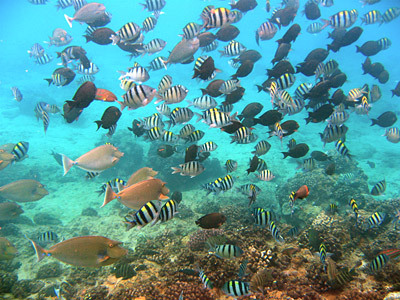 If you're lucky enough to visit one while snorkeling, please give them lots of space. And what ever you do, don't touch. One final shot from Maui, then back to regular business. I'm including this wonderful congregation of fish from a Black Rock dive because it just felt so good to be swimming with them. Hope you enjoy it. See you back in Northern California for my next post. As I continue to work with the Canon SD700 and the WP-DC5 underwater housing in West Maui, I'm getting more comfortable with the rig each day. The only glitch I had today was some fogging on the inside of the housing after a short session of above-water shooting. 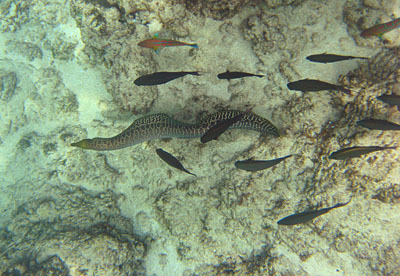 So I had to swim back to shore, take the camera out of the housing, defog, then return for a second tour of snorkeling. I'd also recommend the optional weights that you can get for the housing. I noticed that I wasn't staying submerged as long as I would have liked on my free dives. Part of what was working against me was the WP-DC5 housing that is buoyant by design. The optional weights help counter that. And when you're trying to stay under during a dive, every little bit helps. The top image is a Moray Eel I caught relocating from one rocky area to another. I had to shoot fast to catch him, and the SD700 was very responsive. 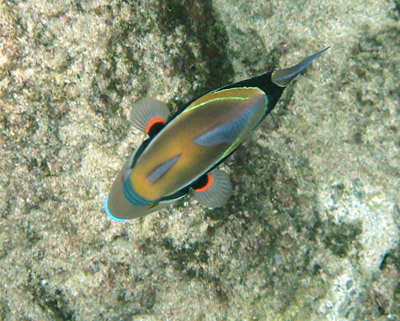 The bottom shot of the Rectangular Triggerfish is from above also. I really like the clown-like face, complete with blue lips, that is displayed on the top of this beautiful fish. Lensbabies 3G Now with Locks... But Why? I was just reading about the new Lensbabies 3G that have mechanisms allowing the user to lock the devices in any position. They look a bit like a lunar landing module, don't they? The locking device does seems like a nice convenience, but I certainly won't be rushing out to buy one. Why? Have you ever noticed that you see people using Lensbabies to take bunches of pictures, but that you rarely see the results? This certainly has been my observation. Yes, it does look fun to use. But how many useable pictures do you really get? Especially when you consider that Lensbabies 3G cost $270 US. That's a hefty chunk of change. 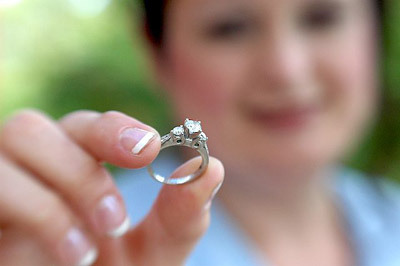 So here's what I'm thinking. If you have a great shot captured with a Lensbaby, send it to me. I'll take the best of the bunch and post it as a grab shot. I'd like to be proven wrong about this. But as things stand now, I see them more as expensive toys rather than creative tools. What do you think? This one is just for the dreaming of it... a high resolution 6x17 (160 million pixels - 7,500 x 21,250 resolution) digital camera that records shots in just one second. Impossible? 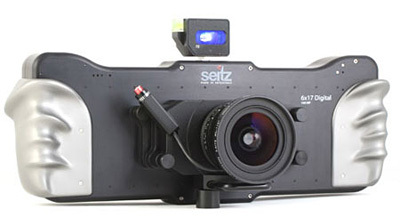 No says Seitz, the maker of this amazing device. 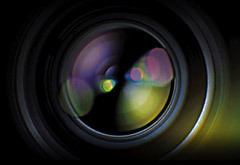 The image sensor was developed by DALSA Corporation exclusively for Seitz. It has very high sensitivity and broad ISO range: 500-10,000, high image quality thanks to 48-bit color depth, low noise, high dynamic range, DALSA anti-blooming feature, Seitz image optimization algorythms, and you have the freedom to use your own raw-conversion workflow. It accepts world-class Schneider or Rodenstock large format lenses (on Seitz lens board) or Linhof Technorama, Fuji and other large format lenses (on adaptor plates). Bottom line, you get a gigantic digital panorama at nearly the speed of many "regular" digital cameras. Here's a trick that only requires a 1/4" bolt and some sturdy string. The result? A super portable tripod that helps you steady your camera up to 2-f/stops of light or more! Call it a poor man's image stabilizer. First, take a sturdy length of string and create a loop at one end big enough to slide your foot into. Then determine the length your need to hold the camera up to your eye. Attach the 1/4" bolt to the other end of the string at the proper length. 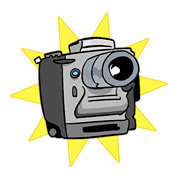 You're now ready to shoot. Slide your foot through the loop, attach the bolt to the camera's tripod mount socket, and pull the camera upward until the string is taut. You'll be amazed at how steady you can hold the camera as you gently squeeze off a shot. Normal acceptable handheld shutter speeds are 1/30th of a second. 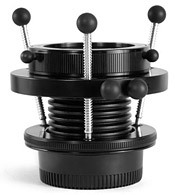 With the string tripod, you should be able to shoot all the way down to 1/8th of a second. Give it a try!